I don’t trust that my personal files will remain safe in the hands of third party cloud services. Their underlying technology is not open source (so no-one can audit it), employees might have a way to access my files, or a govermental institution might request to see my data without my knowledge. There are privacy-focused alternatives to Dropbox such as SpiderOak, but then I still have to trust their marketing, since I have no way to check how safe my files are in there. Therefore I decided to implement the security layer myself, and stop having to trust these services altogether. I went looking for a solution, and I found an open source command line tool called duplicity. This program lets you backup a directory from your local filesystem to a wide variety of “backends” (including Dropbox), while encrypting all your files with GPG before sending them to the destination. If unauthorized parties try to access my Dropbox files, they will only see encrypted garbage. 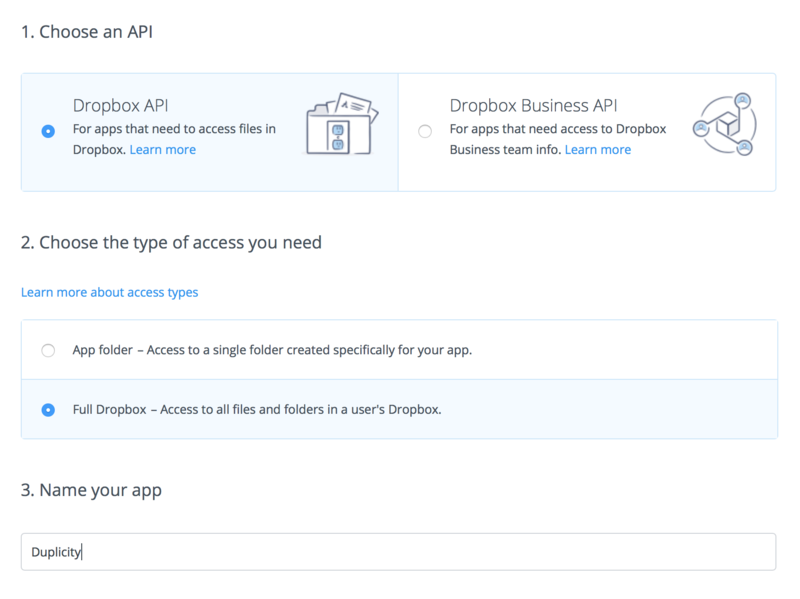 Duplicity uses the Dropbox API. Therefore I got rid of the Dropbox client I installed on my computer. I then moved my $HOME/Dropbox directory into $HOME/Cloud, but you can call it whatever you want. Duplicity allows the user to perform full or incremental backups. The idea is that you initially do a full backup, and then you can trigger incremental backups every time you change something. You can then find the access token specific to the application. In this case it’d be 91B08B2CBA5EAB1A. I recommend going through this tutorial if you don’t have a GPG key yet. The --use-agent makes Duplicity connect to the local GPG agent running in my computer before prompting me for a password, in case its already cached. The --encrypt-sign-key option tells Duplicity which GPG key we want to use for both encryption and signing. So that Duplicity only uploads the things that changed. Duplicity will complain if $HOME/Cloud exists, so you might want to set --force to make it override it. If you have various backups, you can go back in history by passing the --time option along with a RFC 3339 timestamp. A security increase almost always comes with usability drawbacks. 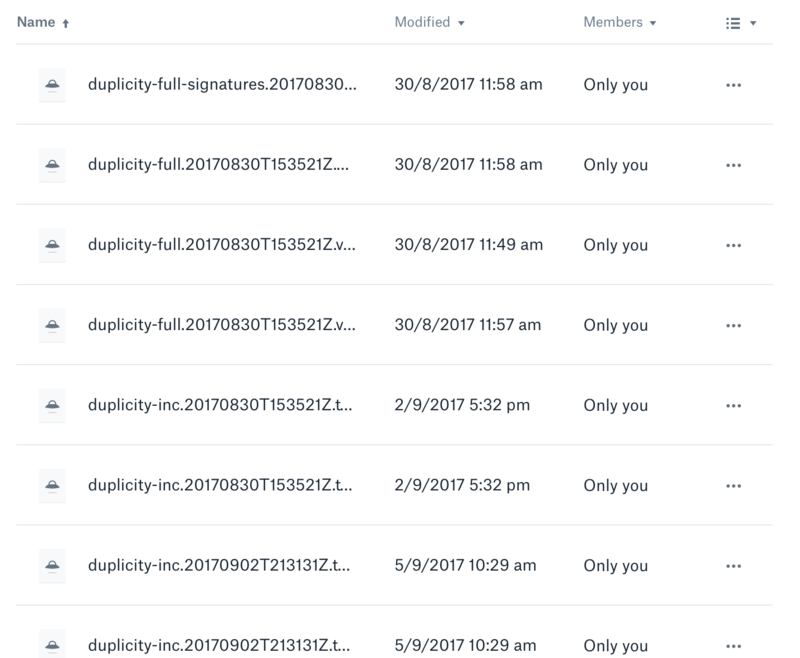 Duplicity will not automatically upload changes you made on your directory. If you want to sync your changes like the Dropbox desktop client does, you can setup a cron job that will call duplicity every hour or something like that. You will not be able to access your Dropbox files on a mobile device, or a computer that doesn’t have both Duplicity and your GPG keys on it. I exclusively use my laptop for 99% of my computing needs, so I’m with this. If you have more than one computer syncing your Duplicity directory, you need to make sure you have the latest changes before sending an incremental update, since there is no automatic conflict resolution system. Finally, Duplicity has to encrypt all your files with GPG, which means that performing a full backup is much slower and intense compared to plain Dropbox.